Grist Mill in Franklin Grove, Ill. Looking for a unique place to explore? If you seek a quiet retreat that’s chock-full of history, surrounded by natural beauty and near to shopping opportunities, you may want to take a time-out in Franklin Grove. Located just 90 miles west of Chicago, the rural community is situated near the beautiful Franklin Creek State Natural Area. First settled as a village in the 1830s, the past two decades have reshaped the village and surrounding locales as tourist destinations. From charming Chaplin Creek Village to the historic Grist Mill and breathtaking scenery of Nachusa Grasslands, the Franklin Grove area has much to offer. Nature enthusiasts will want to visit the Franklin Creek State Natural Area, located just northwest of Franklin Grove. Within the nearly 900-acre park are points of interest such as Franklin Creek, several natural springs, the Grist Mill, hardwood forests, bedrock outcroppings and a vibrant array of flora and fauna. Hiking, camping, fishing, cross-country skiing, snowmobiling and horseback riding opportunities abound. Built in 1847 and located in the Franklin Creek State Natural Area, the Grist Mill was an early-American corn meal and wheat flour-producing mill established by early settlers. Over the past few decades, the mill was reconstructed to look as it did in its glory days, before it became rundown in the 1930s. Reconstruction began in 1992 and the mill became operational in 1999. It’s the largest and most complete gristmill in Lee County, and the only one in Illinois powered exclusively by water. Maintained by The Franklin Creek Preservation Area Committee, the entire building features timber framing from the original structure and is constructed with wooden pegs. An authentic water wheel and set of grinding stones grind corn to make corn meal sold in the small gift shop onsite. 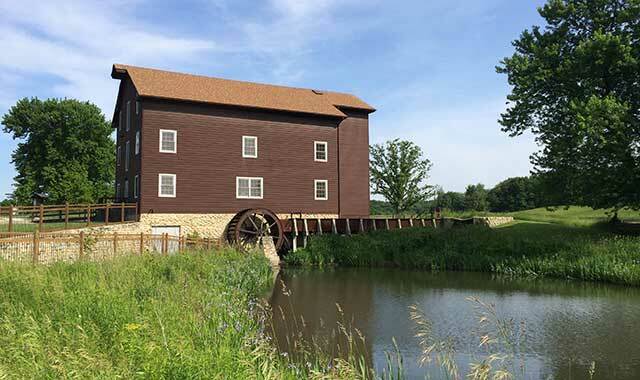 The mill is open weekends from April 1 to Nov. 1. Rod says volunteers are always needed and welcomed. Several events take place throughout the year, including mill dinners and programming. From May 28 to July 9, a traveling Smithsonian exhibit focusing on waterways will be featured on site. During the middle of the 19th century, early settlers established the village of Chaplin. The Franklin Grove Historic Society has put together a full-scale depiction of what the original prairie settlement may have been like. Original 19th century buildings from several communities have been relocated here to form a quaint village setting. “A lot of history is preserved in the area,” says Franklin Grove Historic Society President Tris Bramby. Structures relocated from nearby communities include an early settlers cabin, gazebo, barn, saltbox-style house, jail and schoolhouse. Tours are available and there are several events featured throughout the year. Harvest Festival is the biggest. Visitors enjoy live folk music and demonstrations from blacksmiths and reenactment groups during Harvest Fest. Food vendors sell pie and other goodies, and there’s a pig roast. Herbs, period handcrafted items and other wares are sold and antique farm machinery from around the area is displayed. “When it comes to the whole aspect of living history, a great deal has been presented here,” says Bramby. “People are always interested in coming, and it’s a good feeling for them to be able to see and be a part of that history.” Learn more at chaplincreek.com. One of the earliest transcontinental highways for U.S. automobiles, the Lincoln Highway originally ran coast-to-coast from Times Square in New York City to Lincoln Park in San Francisco, crossing through 13 states. Along one part of the present-day stretch of highway, crossing through Franklin Grove, is the historic Lincoln Building. It’s been the site of the famous highway’s national headquarters since 1999. Built in 1860 for use as a dry goods store by Henry Isaac Lincoln – a relative of President Abraham Lincoln – the structure later became a post office, community newspaper, dance studio and arcade. For many years after, the building sat empty. In 1995, a group of 10 men dubbed itself Farming Heritage Inc. and enlisted the help of restorationist Ron Nelson. The building contains many pieces salvaged from its past and continues to undergo renovation. Its lower half houses a general store where locals sell crafts and goods on consignment; Lincoln Hall, on the top floor, features Blues and Blue Grass music shows each month. The facility regularly welcomes visitors from all over the world. Nachusa Grasslands is a great place to reflect and unwind and is open from dawn to dusk. Featuring nearly 4,000 acres of prairies, savannas, wetlands and working lands, the area is operated by The Nature Conservancy. Guests can enjoy hiking along mowed lanes or through lovely wild expanses of flowering plants, prairie grasses and forest. One of the best reasons to visit? Lucky visitors will catch a glimpse of the resident bison herd, which roam across 1,500 acres. The bison are sometimes difficult to see, however. “Bring binoculars,” advises Bill Kleiman, conservancy director. Many uncommon and rare plants and animals are located in Nachusa, including prairie bush clover, turtles and a variety of grassland birds. “The Nature Conservancy sets a high bar for land stewardship at Nachusa Grasslands, where staff and scientists work together to attempt to create a diverse natural area,” Kleiman says. Autumn on the Prairie, an annual event which takes place at the conservancy the third Saturday in September, is a big draw for tourists. The event features 35 different guided tours, tractor-pulled wagon rides, live music, kettle corn, live birds of prey, local artists at work, children’s activities and food vendors. Learn more at nachusagrasslands.org. After a day out and about, you can kick back and relax in this 1912 home situated on the historic Lincoln Highway, which opened as a bed-and-breakfast in 2015. The B&B is a destination experience and owners encourage guests to engage in their surroundings. The inn features spa services, saunas and fireplaces. Ayres strives to be environmentally responsible by recycling waste, composting and providing locally sourced fare. Learn more at Lincolnhighwayinn.com. For a more rustic retreat, check out Franklin Creek Cabin, situated near the entrance of Franklin Creek State Natural Area. This three-bedroom, two-bath cabin has a kitchen with all the essentials and is close to points of interest such as the Grist Mill. There are accommodations for horses on the property and guests can make use of a gas grill and relax on the front and back decks. This entry was posted on Wednesday, June 29th, 2016 at 11:55 am	and is filed under Recreation & Destinations. You can follow any responses to this entry through the RSS 2.0 feed. Both comments and pings are currently closed.